A high-class new train between Delhi and Varanasi has been flagged of by the Prime Minister Narendra Modi on 22 January 2016. The train ‘Mahamana Express’ was named after Pandit Madan Mohan Malaviya popularly known as Mahamana or the ‘great human being’. Pandit Malviya has also been the founder of the renowned Benaras Hindu University at Varanasi. The superfast train covers the Delhi, Lucknow and Varanasi route in 14 hours.This train is part of Indian Railways ‘Model rake project’. This is the first train with new coaches renovated at the Carriage Rehabilitation Workshops at Bhopal. The work of redesigning the interior of the coaches began in 2011. The trainis scheduled to run from Varanasi on Tuesdays, Thursdays and Sundays. Departing from Varanasi at 6:35 pm, the train will reach Delhi at 8:25 am the next day. The superfast train has only few stoppages which include Ghaziabad, Moradabad, Bareilly, Lucknow, Sultanpur and Jaunpur. The train would be operational from 25Jan. 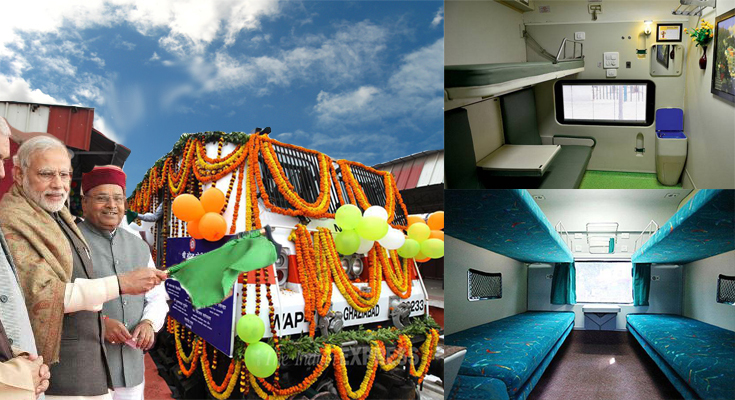 All the coaches in the train are equipped with modern facilities. The outstanding feature is the newly designed ladders to climb to the upper berths. Snacks table has been added for side berths. The conventional window curtains have been replaced with poweredvenetian blinds and roller blinds. The new aesthetically appeal toilet modules have bigger mirrors, wash basins with platforms, controlled discharge water taps, a functional odourcontrol system, exhaust fans and convenient dustbins. Each of the coach is equipped with bio toilets, which is the first of its kind on Indian Railways. Besides LED reading lights, LED lights for berth indicators, and fire extinguishers have been provided in all the coaches. LED lights have been provided to enhance illumination and service durability, which also minimize power consumption. Pantry cars have also been provided with electrically operated chimneys. E-beam cables and polyamide conduits have been used for enhanced electrical and fire safety. The new train will be first train to travel on the electrified section between Ghaziabad and Moradabad. The basic fare of the train will be 15 percent higher than the normal mail/express basic fare because of the improved interiors. But the fair has not been increased for second class or unreserved class. The train has 18 coaches which include one First AC, one AC ll tier, nine sleeper classes, four general classes and two second class with luggage van. This new model will also be replicate in other trains across India. This new train was designed primarily to make travel safe and easy for the passengers.